You may have heard by now that our project won the Remodelista Considered Design Award in its category. We are so excited to have been nominated by the great Will Taylor of Bright.Bazaar fame (http://www.brightbazaarblog.com) and are grateful for all of your support and votes. Remodelista is a design-oriented web site we’ve been admiring for years so being recognized by them is incredibly rewarding. Here is my interview with Remodelista in case you missed it. Q: What does your firm specialize in? A: Daleet Spector Design is a collaborative design studio that specializes in residential interior design, boutique hospitality design, and product design. Q: Who worked on the project? A: Interior design by Daleet Spector, assisted by Egan Gauntt, building by EBR Construction, Inc., and photography by Lee Manning. Q: What were your practical goals for the project? A: Our goal was to enlarge the bathroom and create space for a separate shower and tub as well as two sinks for our client’s two young boys. Q: What solutions did you find to your design problems? A: To enlarge the bathroom, we had to borrow space from the boys’ bedrooms on either side of the bathroom. On one side we were able to utilize a bit of one boy’s closet to recess the shower. On the other side (where the sinks are) we moved the bathroom wall over, borrowing about three feet of bedroom space, and relocated the boy’s closet and bed to the other side of the room. This allowed us to widen the bathroom and fit a separate bathtub, shower, and larger sink vanity. We also moved the window and the door to the bathroom in the remodel. Q: What are your favorite features of the project? A: The floor tile. We’re lucky our client was willing to go for a graphic pattern on the floor. We absolutely love this cement floor tile from Popham Design. A: From the desert to the mountains, the California landscape is so incredible and the natural, organic elements—the beach, ocean, sky, mountains, and desert—are a constant source of inspiration. The existing architecture and the client’s style and way of life can also be major sources of design inspiration. 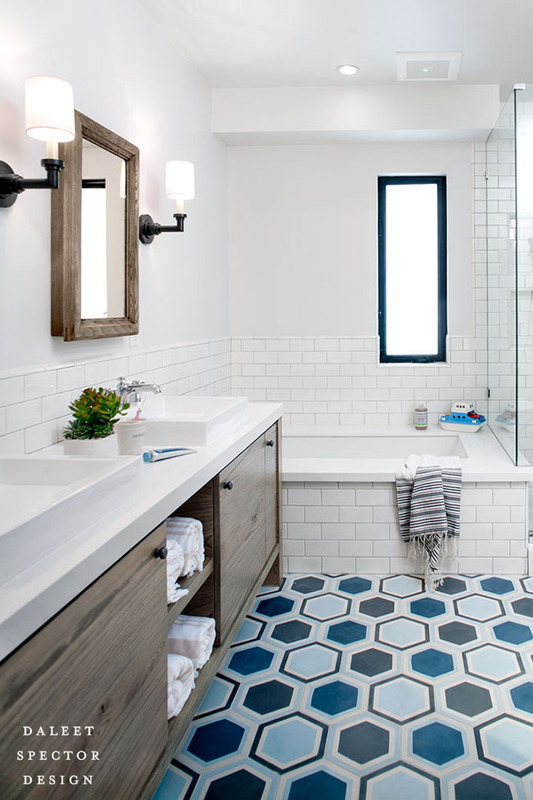 A: Our major splurge was the cement tile floor—this is really the major design statement in the bathroom. Q: Where did you cut corners? A: Because the floor is so focal, we were able to cut corners by using the most basic and economical white subway tile for the shower, tub surround, and backsplash. Q: What is your dream project, or who is your dream client? A: Our dream project could be large or small in scale, there just has to be something that excites us—be it the architecture, the surroundings, or the client’s personality and aesthetic. We love projects that involve both remodeling and decorating, where we can really make a big impact. Our dream client is sophisticated yet casual, realistic with time frames as well as budgets, and completely trusts our design aesthetic—sounds very much like our client on this project!